This is my season, springtime, when the world comes alive. Peach trees are ablaze in ruffles of pink, the first tulip appeared today, daffodils are in their full glory and the birds are setting up house-keeping. To celebrate spring today, here's what's on the menu at our house. 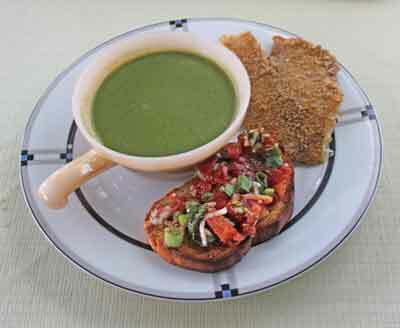 Kale soup, broiled fish with Cajun spices and homemade bread bruschetta. It's a simple meal but worthy of spring. Last year's kale lived over and we've been picking it all winter. Josh picked a big batch for the soup and there's still plenty left in the garden. Kale is amazing, it just keeps on producing for months. It takes a big bowlful to make the soup. I'm guessing this is a pound, at least. The method is simple: slice up half an onion and 4 or 5 garlic cloves and saute them in olive oil in a cooking pot. As soon as the onions are turning transparent, pour in 1 quart of chicken broth and bring it to a boil. As soon as the broth is boiling, add the kale to the pot. 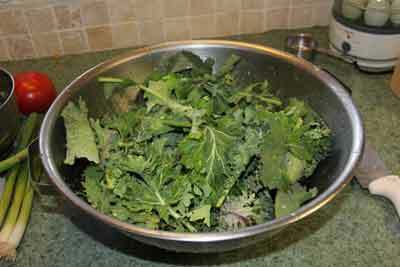 The cooking pot will be nearly full of the fresh kale. Put a lid on the pot and let it come back to a slow boil. 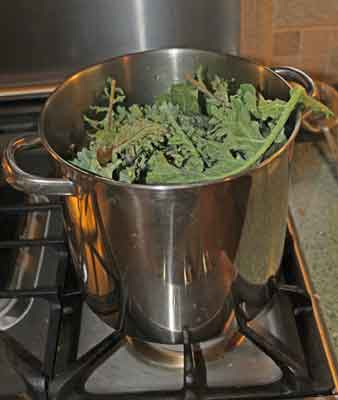 Push the kale into the hot liquid and let it simmer for about 15 minutes, or until the kale is tender. Working in batches, puree the kale in a blender, adding additional water as needed. When the kale and liquid is all pureed, pour it back into the cooking pot. Bring it back to a simmer and add either 3 cups of whole milk, or 1 cup of half and half. Serve hot. 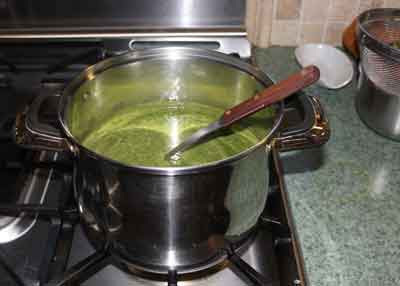 Kale soup, ready to serve. Josh made a loaf of sourdough French bread so I could make bruschetta to go with the soup. Sourdough, if you don't know, is better for people with diabetes than regular bread, so I indulged and had 2 slices! 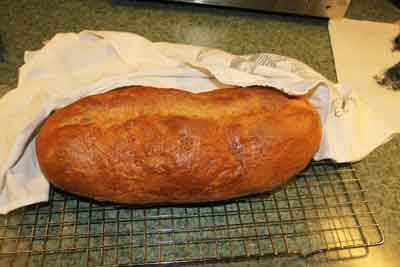 Perfect loaf of sourdough French bread, right out of the oven. The Bruschetta is simple. Dice a couple of Roma tomatoes. To that, add 2 diced green onions, 3 cloves of minced garlic, 1 tablespoon of fresh basil, 1 teaspoon marjoram and a tablespoon of balsamic vinegar, with a dusting of salt. Mix lightly and set aside for at least an hour. 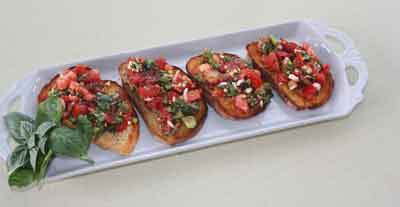 To make the Bruschetta, cut 4 slices of French bread and brush them well on one side with olive oil. Toast the bread slices until brown and bubbly around the edges. Divide the Bruschetta mixture between the 4 slices of bread, piling it on top. Serve immediately. Where did the fresh basil come from this time of year? Josh's mother had left us with her AeroGarden and it's great for growing herbs indoors. We've been harvesting basil all winter long. 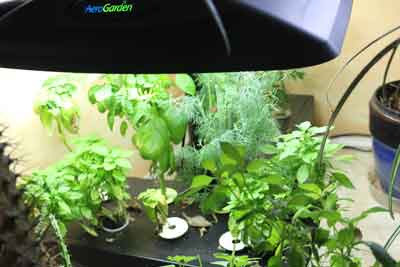 The assortment of herbs growing in the AeroGarden. 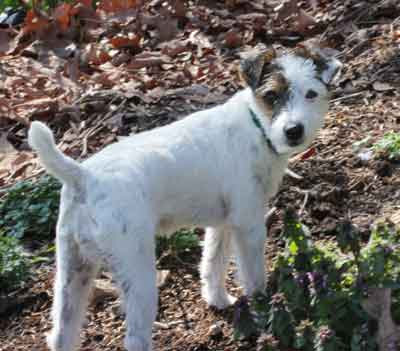 That's Cricket, investigating every aspect of springtime, even the bees, lizards and flowers. Happy spring to you! 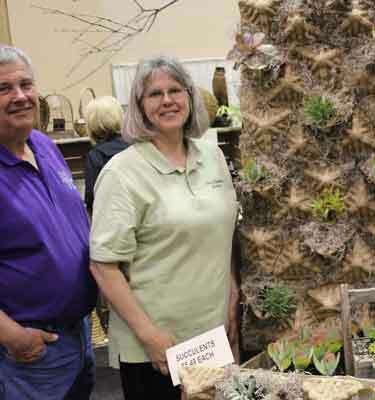 I was in Sioux City, Iowa for the past several days, as one of the speakers at the Siouxland Flower and Garden Show. It was a small show in size but it made it up in quality. I've almost quit speaking at such shows because so many consist of rows and rows of gutter sales booths, siding, hot tubs and driveway paving supplies. This show was different - it had all sorts of things for the garden. There was a big line-up of excellent speakers, as well. Our long time friends, Jack and Jane Hogue, of Prairie Pedlar Herb Farm in Odebolt, Iowa, were the ones who arranged for me to be there. Besides herbs, they grow corn for Jolly Pop popcorn, host weddings and raise lots of pigs. Jane is highly creative and she's standing next to her sedum garden, made from a pallet on which she has nailed cardboard corners from shipping cartons. Very cool and perfect for a sedum collection! This was my trade show booth, above. I'd taken along lots of books and a few other products. I was pleased, even in a northerly state, with snow blowing outside, the new Hot Sauce book sold very well! 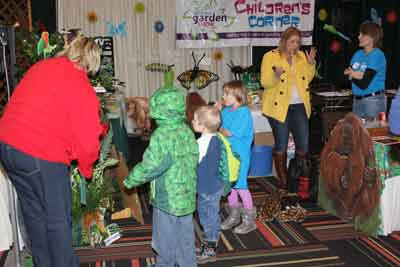 Like any good garden show, this one had a Kids Corner, where kids were given lessons about recycling, about where garbage goes and how they can help. It was actually pretty cool in how they'd made it fun for kids while teaching responsibility. 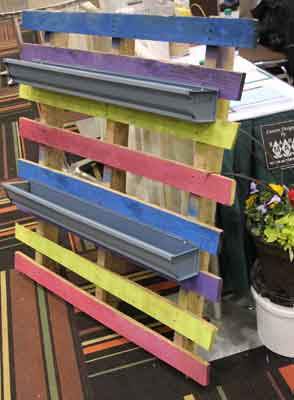 There were lots of "Make and Take" projects for the public including make a rain barrel for your home. And this planter, above. It's made from another pallet, with pieces of metal gutter screwed on. You simply fill the gutters with potting soil and plant herbs or flowers! I liked these little hand gardens, too. 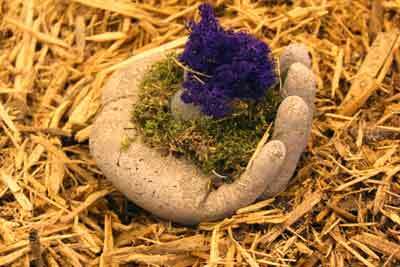 They're made of concrete mixed with perlite, poured into a rubber glove held in place in sand. 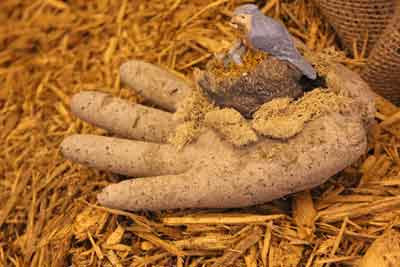 When it sets up, the glove is removed and you have a lightweight hand for a planter. 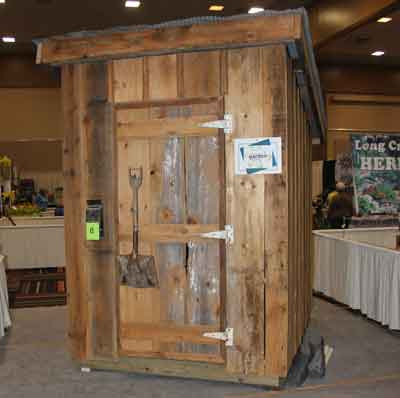 This garden shed was made completely out of recycled materials. 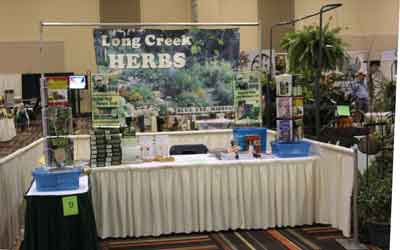 As people entered the garden show they were given cards to fill out for door prizes. 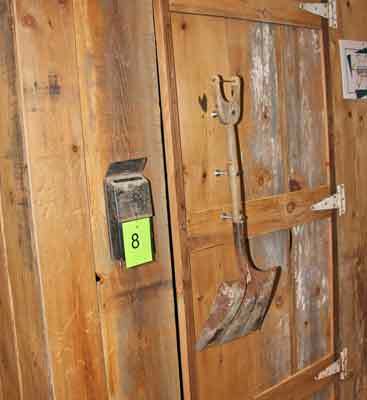 This shed was the biggest door prize to be given away. I thought the shovel being used for the door handle was a fun idea, too. 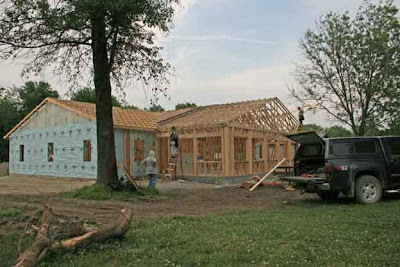 The shed was constructed in such a way that it was unbolted, stacked flat and delivered after the show to the winner where it was bolted back together. 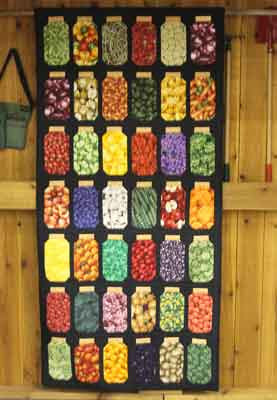 This quilt, made by a lady in the county Master Gardeners was a hit, as well. You probably can't tell from the photo, but each "jar" is made of fabric that has vegetable or berry designs. My programs were: Growing the 10 Most Popular Herbs, a Salsa-Making demonstration and on Sunday, Pizza Gardening with Your Kids. 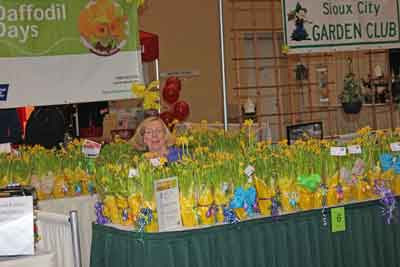 This was one of the best flower and garden shows I've been to in years and I was pleased to be a part of it. 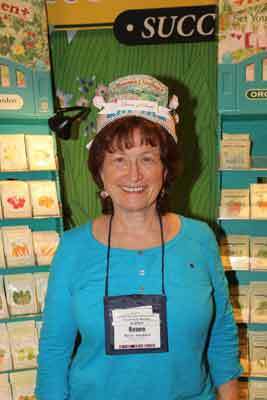 I have to tell you about my life-long gardener friend who just passed on to the great garden in the sky last week. 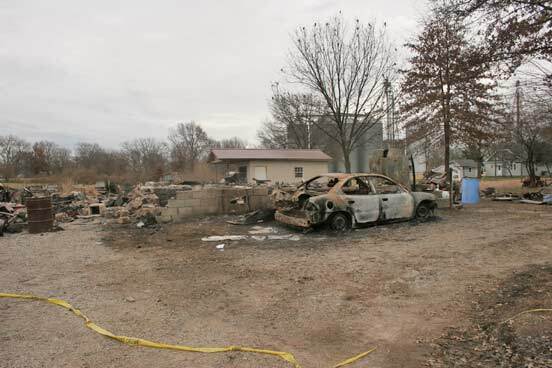 Long-time readers of this blog may remember when I posted about Ester Shouse back in November of 2008, after her house burned. Lots of readers sent gifts to Ester and her family, for which I am eternally grateful. Ester and her husband, Roy, were neighbors when I was growing up. My parents ran a rural grocery store and the Shouses were customers. More than that, they were friends. I remember when nearly all of their 9 children were born and I went to school with nearly all of them except for the youngest. The 5 boys and I swam and fished together. Roy took me hunting and fishing many times, always treating me like one of his own. They were always like the family I wanted to be a part of. 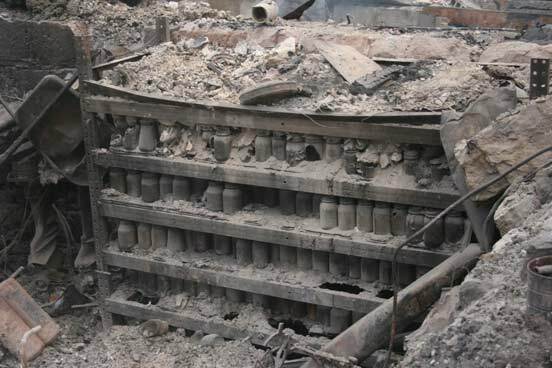 All that was left of hundreds of jars of canning, 2008. Ester's was the kind of home where I always knew I was welcome, any time of the day or night. I didn't have brothers or sisters, so being treated like part of the family was a real joy for me. I knew if I stopped by for a visit, even well after dinnertime, there would be something cooking on the stove in the kitchen and someone would likely offer me some. That's how I was first introduced to hot peppers. (I dedicated my new book, Make Your Own Hot Sauce, to Ester, for introducing me to hot peppers all those years ago). Ester's sons built a new house for Ester in 2009. One night, when I was in my early 20s, around 9 or 10 p.m., I stopped by the house. One of the boys offered me a bowl of chili and I accepted. Ester didn't know I wasn't used to eating hot foods, but as my face turned bright red, she started laughing. "I should have warned you I always put hot peppers in my chili," she said. But I kept eating and the next time I ate chili at Ester's house, I knew what to expect. 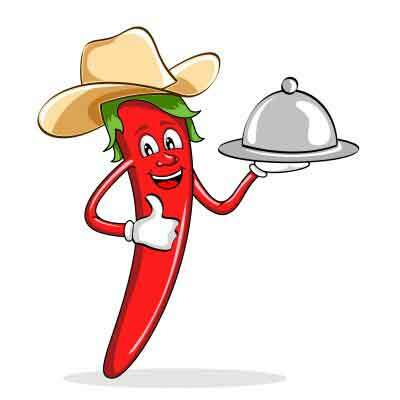 Over time I came to love hot food and started growing hot peppers for my own use. 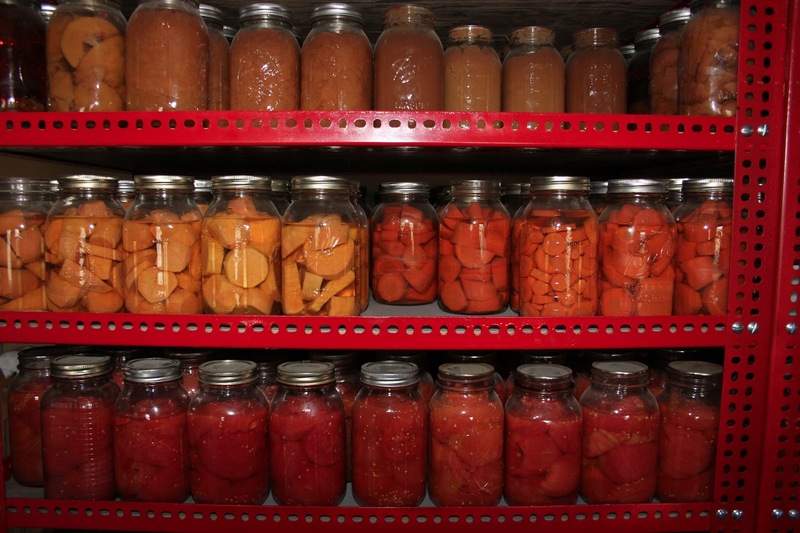 There are several more shelves like these, all filled with 2012 canning. Ester was remarkable in so many ways. 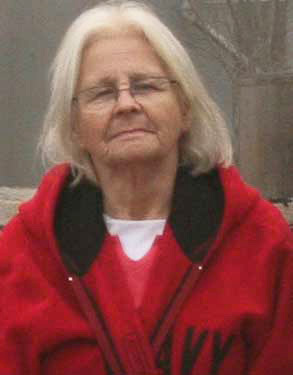 She and her daughter, Ellen, came to visit every summer for the past several years at my home in the Ozarks. We'd sit on the porch and talk gardening and gossip about people we knew. It was there, sitting on my Herb Shop porch that I learned just how much gardening Ester actually did. I'd always known her as an outstanding gardener and had seen her garden many, many times, but over the time of our visits I learned that she planted 500 cabbage plants each spring and nearly all of that went into jars of sauerkraut. She told me how many potatoes she planted (two 100 pound sacks, as I recall). Five hundred onion plants, pounds and pounds of bean and corn seed. And the kids would come home and help her can and freeze what she grew. One very small section of Ester's summer canning this year. Ester died this past week, at age 83. She had 3 heart attacks, being taken by ambulance twice, helicopter once, to the hospital in Kansas City from her home in Rockville, MO. She came home a couple of times in the past several weeks to recuperate. Between her second and third heart attack, just 2 weeks ago while she was home "resting," with the help of 2 of her sons, Ester canned 123 quarts of pinto beans! She was like a second mother to me, someone who always accepted me no matter what crazy thing I did. My own mother died in 1987, and so Ester became ever more important to me. 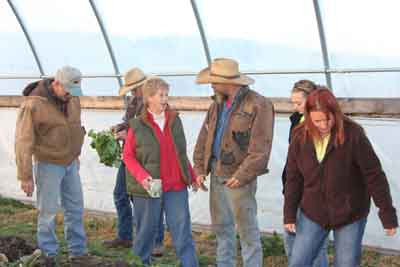 We were friends, but more like family and I am so grateful to have known this amazing woman and courageous gardener. 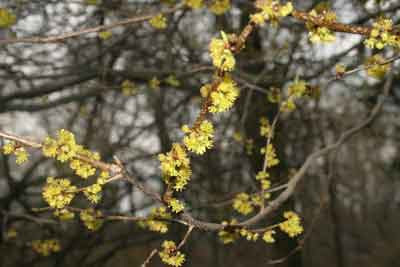 Spicebush is one of the earliest herb bushes to flower in the spring. Some years it's blooming in late February and ours was just beginning. But this week it's in full form. The flowers are tiny - although in my photo above the look deceptively larger. The fragrance is sweet but faint, the kind of smell you notice while walking in the woods but can't quite detect where it's coming from. This is a plant I came to love, thanks to my late friend, Billy Joe Tatum (who I've written about many times here, before). 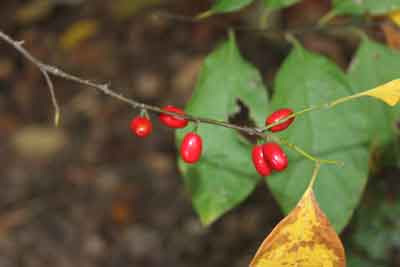 Spicebush berries in the fall, also good for seasoning. Spicebush is one the few shade-loving herbs. It will grow in dense shade or part sun, even finding its way into open meadows. The plant is native from Ohio down into Eastern Texas and as far north as Central Missouri. It can grow out of its native region and likes moderate to moist soil conditions. It grows to the size of a lilac bush and spreads very slowly by root division. 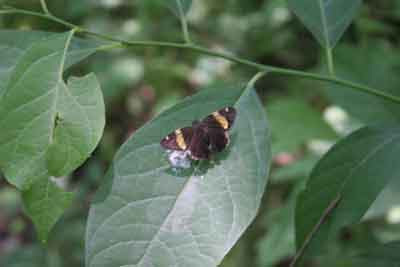 Spicebush swallowtail butterfly on spicebush leaves. 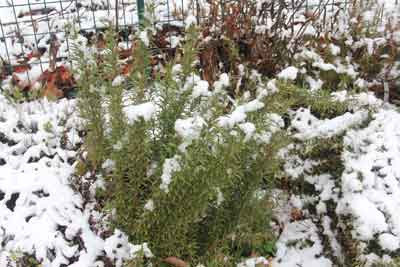 Why is this such a good herb to grow? The leaves, twigs and red berries are all excellent for cooking. 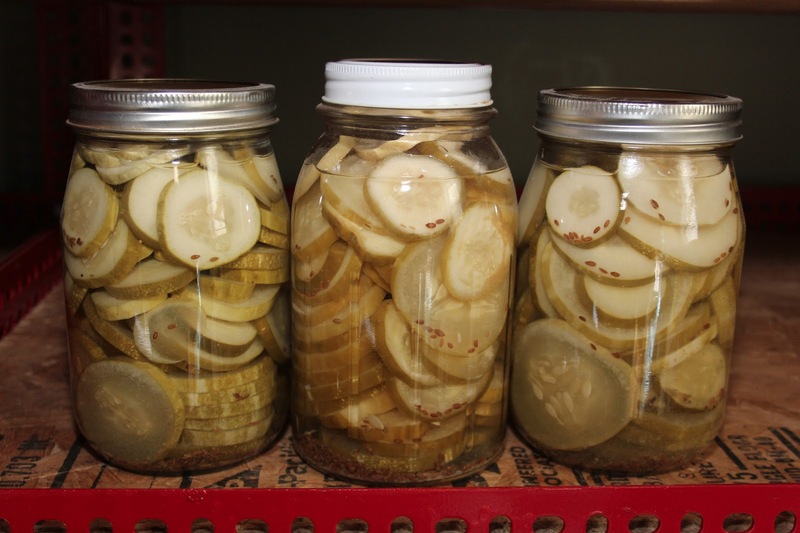 It's especially good for wild game, venison, stews and the like. My friend Billy Joe, used to cook venison using a combination of spice bush leaves/twigs or berries, along with red wine, soy sauce and garlic, making a marinade for the venison. After 12 hours marinating, the venison was cooked slowly until tender. The leaves, twigs and berries are also used to make a winter tea when you have a sore throat or fever and is an old-time folk remedy. This is a good plant to grow if you want an unusual but native plant for your shade garden. There's also the bonus of bright yellow leaves in the fall! If you do a Google search for spicebush plants, you'll find several nurseries that sell them. Happy almost spring! 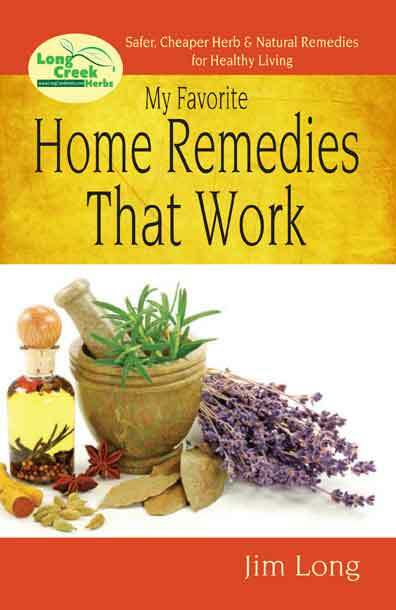 It takes more time than you might imagine to produce one of my "Great Little Herb Books." First the writing, then the recipe-testing, then more recipe testing, then off for layout and design. Following that, weeks of review-edit-adjust, until it's ready for the printer. Finally, one of my 36 or 40 page books is ready to sell. While most of my books aren't large, they're packed full of information and recipes. Make Your Own Hot Sauce, $6.95 + $2 postage. 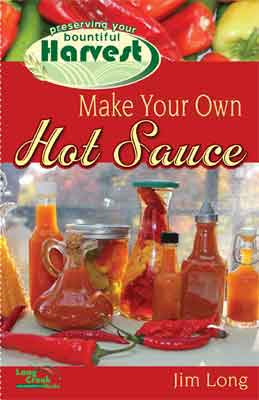 Here's my newest book, Make Your Own Hot Sauce. If you don't count the years of growing peppers or making sauces, then I began this book last August. Throughout the fall I tinkered with my recipes, making gallons of hot sauce. In the middle of the process, when I was having friends test some of the sauces for flavor and heat, I learned something astounding. An awful lot of people don't know the difference between hot sauce, and salsa! So in the beginning of the book, I explain that hot sauce is a seasoning you use by the drop to add heat and flavor. Salsa, on the other hand, is used for chip-dipping. You wouldn't likely use hot sauce as a dip! (See my book, Sensational Salsas from Apple to Zucchini, for lots of tasty salsa recipes). 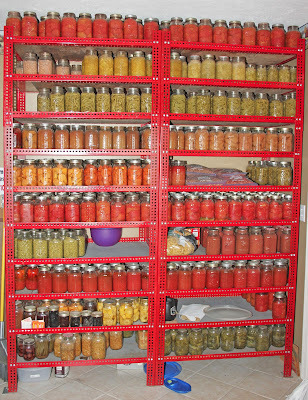 The Hail Family at Bear Creek Farm, tested many of my sauces. 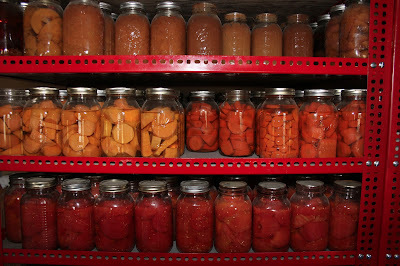 Some of my sauces went to friends at Bear Creek Farm in Osceola, MO. Some went to Kirk R. Brown in Pennsylvania, who did an amazing thing. He set out my assortment of hot sauces and had guests at a party rate them, then sent me the critiques! 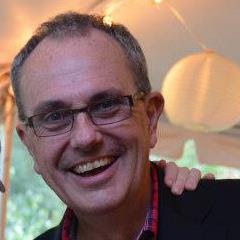 Kirk R. Brown aka "John Bartram"
Another friend, Renee Shepherd (reneesgarden.com), who loves hot food, was also a taste-tester. She gave excellent feed-back and I took that into account, as well. Throughout January I was putting the finishing touches on the book. Then our book designer took over, the proofing and re-re-re-re-proofing took place, which is an agonizing process. Too many recipes, I had to cut a bunch of my favorites to keep the book smaller. Even then, I made it 40 pages instead of my normal 36 and switched to a thinner paper so it would fit within the covers. Finally, the book is on the presses and it will be ready about March 15. Pleasantly surprising, the Hot Sauce book is already selling briskly, even before it's ready to ship! If you like hot sauce, I think you will enjoy my easy, tasty hot sauce recipes. You can order it on-line by March 8 on-line here. It will ship about March 15. Whether you grow your own hot peppers, or buy them at the farmers market or grocery, you'll have fun making your own hot sauces! Two kids, born 2 nights ago. 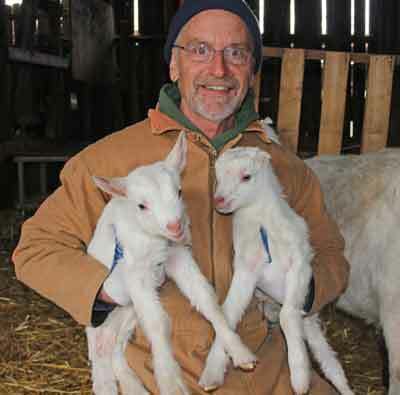 Pick one of the coldest, most uncomfortable nights for weather, and our nanny, Veronica, gave birth to twin males. At this stage, they're so cute. Every blade of grass, every straw or rock or board, is new to them and has to be investigated. 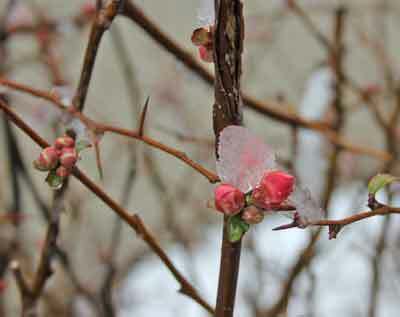 Just a little ice left from our dusting of snow this week, hanging on to the quince buds. Quince is originally to China and Japan. Like forsythia, flowering quince was early-on imported to the U.S. as a landscape plant. I found plant sales listings from the early 1800s, where it was brought up the Mississippi River by boat and advertised for sale in St. Louis. Sometimes on walks in the Ozarks woods I'll find a flowering quince, the only thing left of an early homestead. This is Rosemary 'Barbecue' and next to it, just out of site is Rosemary 'Hill Hardy.' Both have come through the winter just fine so far. I took cuttings of 'Hill Hardy' to the seed exchange in West Plains, MO yesterday to share. The bluebirds are already checking out the houses, getting ready for a spring nesting. I must clean out the old nests this week and get the houses ready for new tenants. 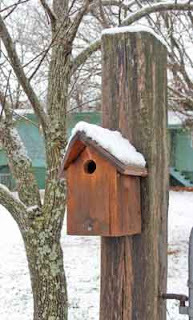 I also have too many bluebird houses near the garden and need to spread them out farther away. While I like bluebirds a lot - one of my favorite birds, they are death on black swallowtail butterfly larvae and eat them all unless I find ways to discourage them. Swallowtails like to lay eggs in the fennel plants, but in last year's drought I lost nearly all the fennel. When swallowtails hatch on dill, they're usually lower to the ground and the bluebirds don't seem to find them as easily. The bentwood trellis that was made about 5 years ago, and on which I grew my Potawatamie pole beans last year, is ready for the burn pile and time to make a new trellis. 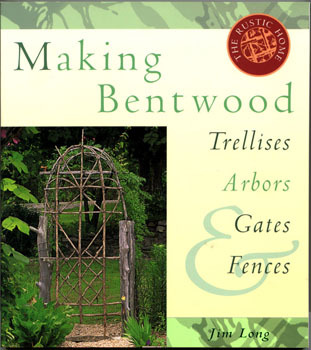 If you don't know my book, Making Bentwood Trellises, I (of course) highly recommend it. It's on my website under Books. 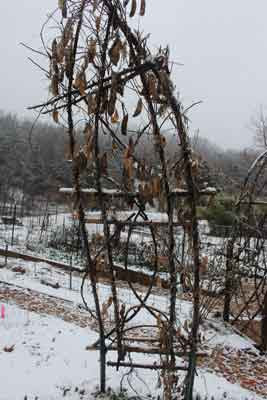 Not much green on a snowy day in the garden. 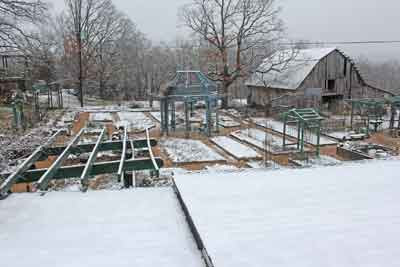 The nice thing about snows in the Ozarks, is they are gone quickly. 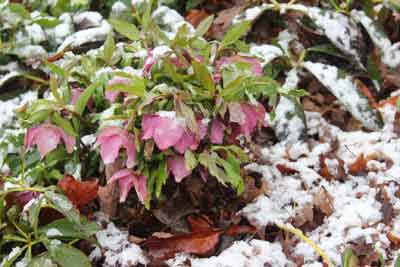 This one lasted to almost noon before it melted away - just enough snow to say we had one. 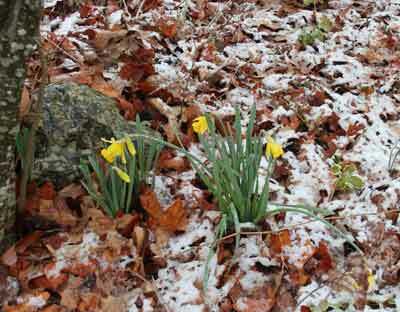 But the jonquils don't mind the little whisps of snow and soon they will win out and winter will be over. I'm encouraged, the more plants that come into bloom, the more excited I become for the garden season ahead!